Strawberry season is almost over here in North Carolina. Usually they are so sweet and yummy, all I do is wash and eat. But this week I decided to actually cook something with the strawberries I got at the Duke Farmer’s Market. This is what I found in Simply Organic. Pre-heat the oven to 350F. 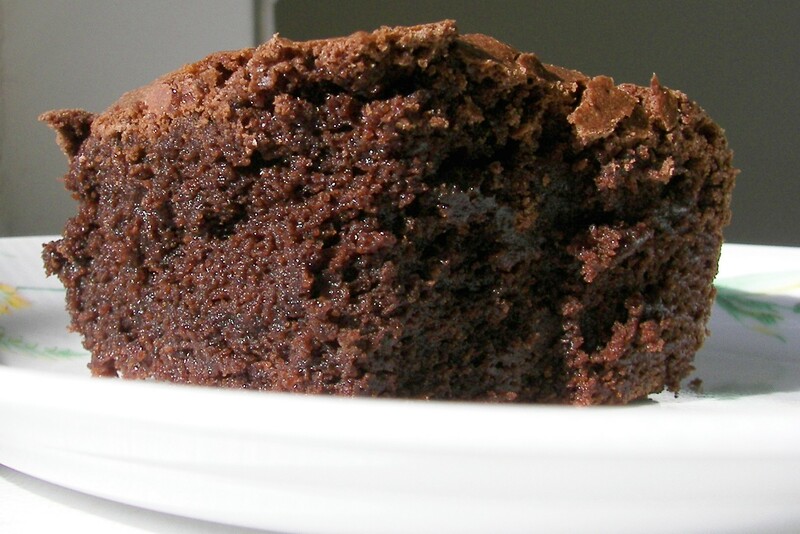 Combine the butter, cocoa, and 1/4 cup of the sugar in a 3-quart glass baking dish. Place in the oven for a few minutes to melt the butter. Remove from the oven and stir until well blended. In a medium bowl, combine the flour, baking powder, cinnamon, and the remaining 3/4 cup sugar. Add the milk and stir until smooth. Spoon this over the chocolate, but don’t stir. Scatter the strawberries on top. Bake for 45-55 minutes, or until your cake tester comes out clean. Let stand for about 10 minutes before serving. 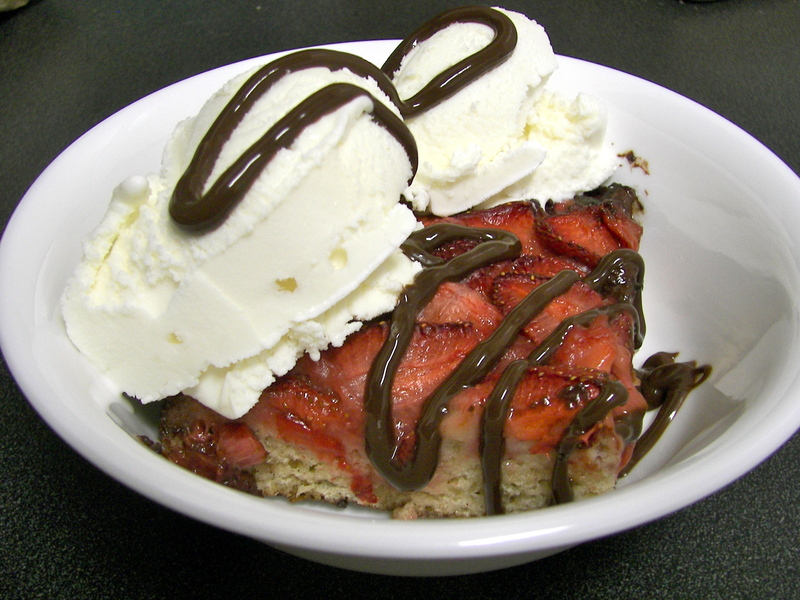 This was great with some local vanilla ice cream from Maple View Farms, and some chocolate sauce. Yum! I have to say I’m quite proud of these. You would never know they were gluten-free unless you were told. I decided to start experimenting with some of my old favorites, turning them into gluten-free recipes. This one worked very very well. It was adapted from a recipe in Martha Stewart’s Baking Handbook. Enjoy. Pre heat oven to 350F. Oil an 8 inch square baking pan, then line with parchment paper. Place butter and chocolate in double boiler to melt, stirring frequently. Once melted remove from heat and let cool to room temperature. Stir in the sugar and whisk in one egg at a time, whisk in the vanilla. Gently fold in the flours and salt. Pour into prepared pan and bake until cake tester comes out with only a few crumbs, about 35 minutes. Transfer to wire rack and cool. I love brownies, who am I kidding, I love anything chocolate. 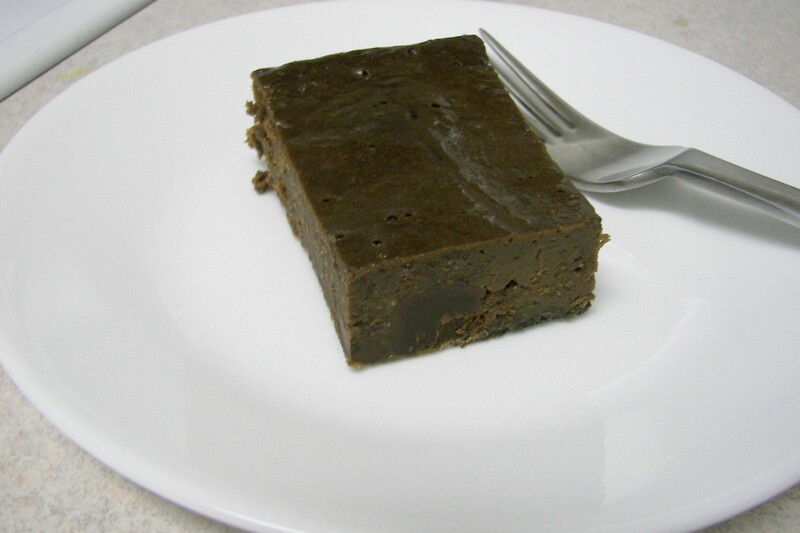 I have recently discovered that I can no longer eat gluten or dairy, so I have been on the hunt for a great gluten-free, dairy-free brownie recipe. I have tried about 4 different recipes and/or store-bought mixes, none have been that good, till now. 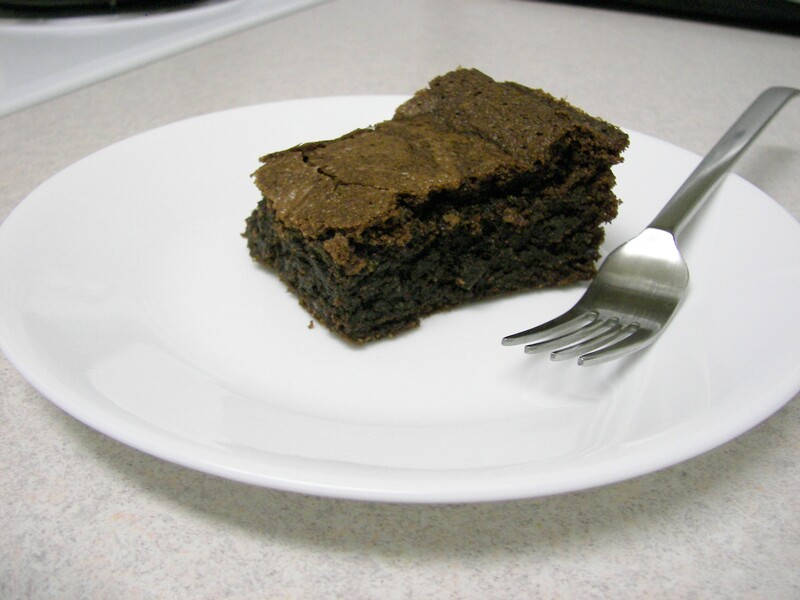 This brownie recipe is really good, I was so happy I was almost in tears when I tasted these. Thank you, Thank you, Thank you to Karina’s Kitchen, The Gluten-Free Goddess. Preheat the oven to 350 F. Butter a 8×8-inch square baking pan. Melt the dark chocolate and butter, either in a double boiler or in the microwave. Combine well. Set aside. In a mixing bowl, beat the eggs on medium high till frothy. Add the sugar and beat until the mixture is smooth. Add the melted chocolate mixture into the egg-sugar mixture a little at a time, incorporate it slowly, and beat well for a good minute. The chocolate will look smooth and glossy. Bake for 33 to 35 minutes, or until the brownies are set. Don’t overcook! 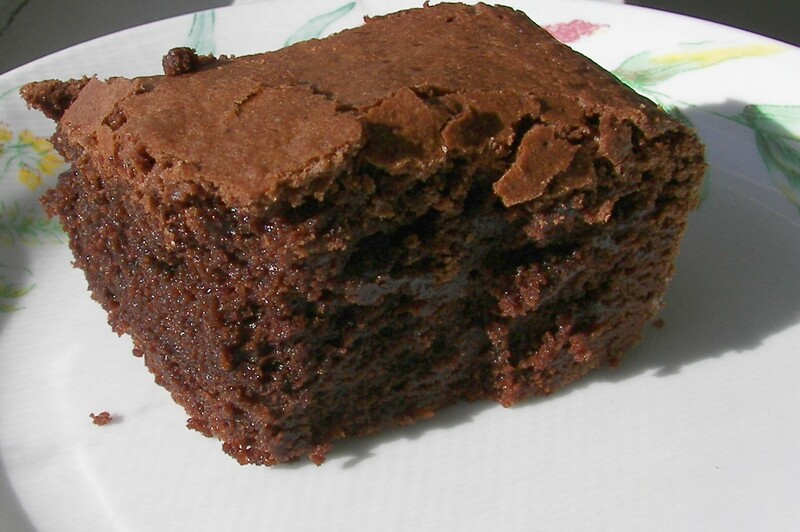 I have made many flourless cakes and brownies before, they are always rich and moist. I came across this recipe while browsing the Whole Foods Market website. When I saw the “secret” ingredient I thought, “I have to make these”. Butter an 8-inch baking pan. Place the black beans, eggs, melted butter, cocoa powder, salt, vanilla, and sugar in the bowl of a food processor and blend until smooth. Remove the blade and carefully stir in the chocolate chips and walnuts. Transfer mixture to the prepared pan. Bake the brownies for 30 to 35 minutes, or until just set in the center. Cool before cutting into squares. I have to admit they are not as chocolaty as I like, so next time I make them I will either try more cocoa powder, or more dark chocolate. But they were good, and you would never in a million years guess they had beans in them.